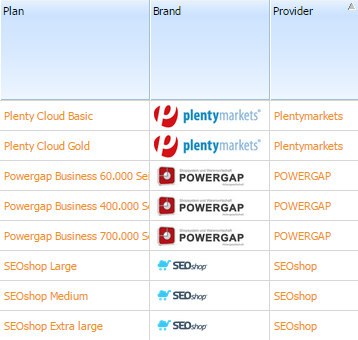 The following guide explains the cart comparison step by step, so you can use its full functionality. whereas the "Complete Comparison" includes all cirteria (in full scope). First-time users, we recommend to get started by the fast comparison. Experts my research with the complete comparison in detail. Determinde the categories (e.g. "Charges") which are important to you, and open the respective group (e.g. 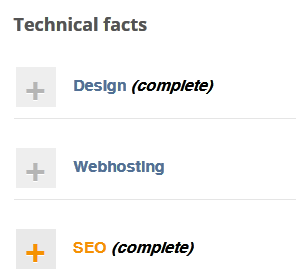 "Legal aspects") by clicking on the "plus" icon. In addition, you will find a short explanatory text in each category and group. Determine criteria as "MUST" or "SEE"
Determine as many comparison cirteria as you want as "MUST" or "SEE". Leave irrelevant criteria in output state. MUST: The shopping cart must fulfill this criteria, I.e. the result only contains plans which accomplish the MUST-criteria. Certain criteria, e.g. charges, cannot be determined as "MUST" as charges do not result in no or yes. SEE: The criteria is displayed in the result, regardless of whether the tariffs fulfill this criteria or not. Instead of selecting each comparison criterion individually, you can also change all criteria of a group at the same time by clicking on ALL OFF or SEE. 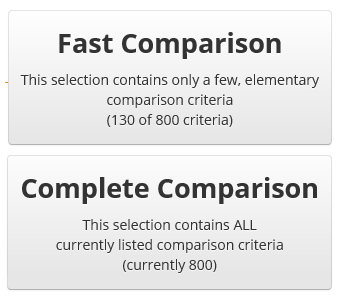 After every comparison criteria is a "i"-symbol (tooltip) that delivers a short explanation of the respective criteria by hovering. 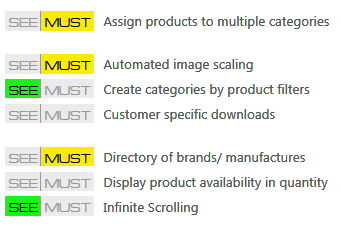 As soon as at least one of the criteria of a group is specified as MUST or SEE, the number of the selected criteria is displayed in the box on the right side of the screen. Click "Show Result" to display the cart solutions that meet your requirements. Your selection of criteria is saved. Even if you log out and log in again at a later date, your previously saved selection is restored. Click on "Reset selected" in order to delete your selection. In the first two columns (on the left side) you will find the cart providers and plans that meet all ot your selected MUST criteria. Click on the column header ("Provider" or "Tariff") in order to sort the respective column alphabetically ascending or descending. referred to the manufacturer or collective website. 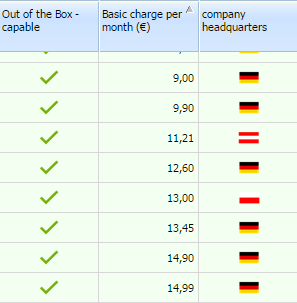 In the column headings (on the top of the screen) you will find the previously selected comparison criteria classified in groups and categories. Move the mouse pointer over the column header or the content of each cell (text or symbol) to get additional information as an overlay (tooltip). Individual lines can be marked by clicking. Hold down CTRL to mark more than one tariff. 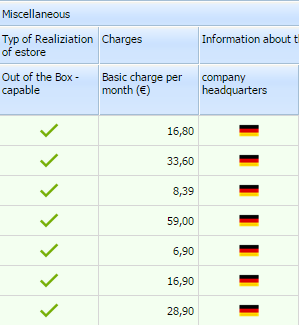 In the comparison view you can click on the column heading (criteria name) in order to sort the shopping cart tariffs ascending or descending according to their data values ​​(cell contents). In addition, you can use the context menu to hide single tariffs by right-clicking. By hovering the mouse you get (if available) additional explanations as an overlay (tooltip). If you have further questions, please pay attention to our FAQ.